We honor coupons and advertised specials from any Utah ultrasound imaging center. Keepsake Heartbeat Animal of your choice included! Military Special: All active duty military families receive a 10% discount on all packages. No additional charge for multiples (when booking online, give us a call to let us know that you are expecting multiples). The Optimal time to see your baby in 3D/4D is 27-32 weeks. The recommend time for twins is 24 weeks or sooner. Please call us to discuss! Our Gender Reveal Parties includes event space, basic decorations and refreshments for you and your guests. 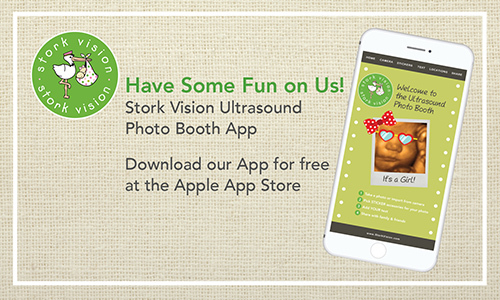 Book Now to experience a gender reveal the Stork Vision way. We can’t wait to meet you and your baby! To Schedule an Appointment Call (801) 414-0132 or BOOK NOW Online! Stork Vision Salt Lake City is conveniently located on Redwood Road in Fox Office Park in Building #5, just minutes from I-15 and I-215. Appointments can be made online 24 hours a day. Appointments can be made by telephone 7 days a week from 9 am-9 pm.